Creating art in a beautiful journal is so enriching to your soul, and even better when you have lovingly hand crafted that journal yourself. Come and join me for this heartfelt adventure, and create your own lovely journal and your girls. For more information on how to join this class, and the supplies list click below. To celebrate I am giving away two spots in this class! I will draw the winners by random number generator in 4 days time (Monday 19th March AEST). Congratulations to Linda Mason and JoAnna Jackson who won the two spots in this class. Altered books will open up a whole new perspective on journaling – just like your Petit Vue Course changed the way I look at buildings now. I just love the wistful style you create. Thank you Toni for the chance to win one of your wonderful classes…and your generosity for the opportunity. Toni Burt I must be stuck in a rut and need a push from behind. Your art work is awesome. I would love to participate in this class. Thank you for your time. Love the easy to follow and affordable art class offered by Toni. I love this art!!! Would die if i won a free online class!!! Wow, this looks like so much fun😆 Love your style. It is so soft and feminine. Thank you for the opportunity to win! Such an ispirational artist! This class looks great. This sounds like a great class. Love your style. Just beginning a journaling journey and would love to learn from you! Your art is so inspiring and I enjoy your videos. Thank you for this opportunity to try your class. Looks amazing, thanks for the chance to win, would love to give this a try. Keeping my fingers crossed. Just love your classes! Keeping my fingers crossed. Just love your style! Squeal! Toni art and old books?!?!! Love! This style of yours has such simplicity, and elegance. Love your art and your classes Toni. Love this . I really live u style of painting. Oh my, another beautiful class! I love old books and while I hate to destroy one, I would like to learn how to “save” an old book by making art. Such lovely artsy goodness, I would be thrilled to win a spot in the class! Such lovely artsy goodness…. I would be thrilled to win a spot! Looks like a lovely class again! This looks like another fantastic class from Toni. I’m in. I love art journaling and your girls always look amazing! Sharing now. I would love to try something like this it looks such fun and I love your expressive girls. This class looks awesome. Too bad I can’t join the giveaway since I don’t do facebook. Love your art and your style! Thanks so much for this amazing opportunity! Would love to take your class! Your ladies are beautiful and who doesn’t want to recycle an old book! 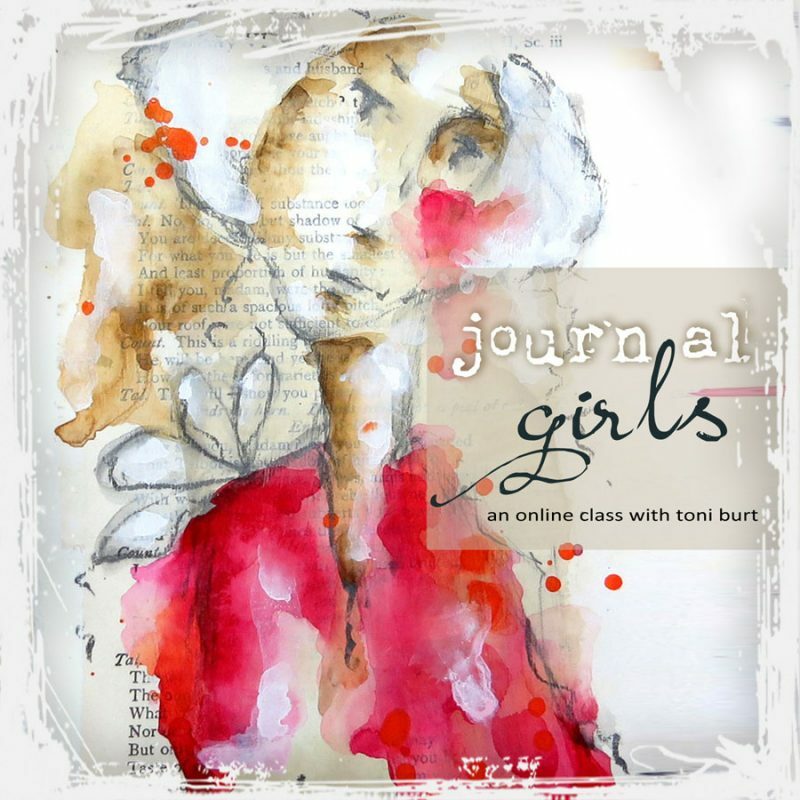 These Journal Girls class looks like fun AND we learn something new in the process. I love these girls! ❤️ Thank you for this opportunity! Love you work! Thanks for the chance to win a class!! I LOVE altered books! This would be the first one I’d make… I love your art Toni! And would love to win this class! This class looks amazing! I would love to take it! I have started an altered book and would love to add the “Journal Girls” to it as well as make a new altered book journal. Would love to learn this art!! Beautiful! Your art looks amazing would love to learn how to do this. Looks like fun and exciting! Would love to win! Ohhhh-how I’d love to win this course…I don’t use FB…is there something else I could do that’s equal to FB? IG maybe?? This is the first I have seen journals repurposing old books. I love books and I love art. Looks fantastic! Would love the chance to win this Toni. Toni, I would love to take this class!!! And guess what? My birthday is Monday the 19th, the day you announce the winners. How cool is that!?! I may have to buy the course as a “Happy Birthday to me” gift. 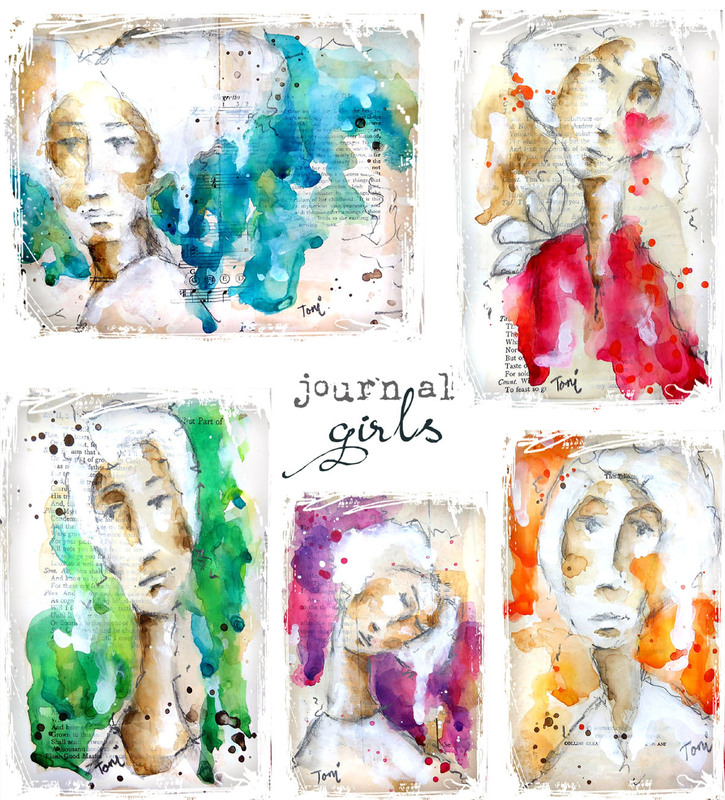 I’ve been loving these journal girls when I see them on Instagram and Facebook. Would love to win the class! I’m fascinated at your skill for omitting lines in the face and body, but still conveying the whole idea. Oh boy, look at how yummy!! I’d love to look into this process and see you transform a book into your beautiful art. I love altered books, art journaling and would love to learn how to create beautiful girls in your style from you!! This looks like a great class. Love your ‘girls’! And the journal! I so wish I could paint girls like this! Absolutely stunning!! Completed all the steps! Altered books are one of my favorite places to create. Your class looks fabulous and a must to take part of for further inspiration. Thank you for this offering, Toni. My favorite is using the old music books behind the pictures. They tell such a story! love old smelly books and how they can be made into a journal that is so personal. Shared! I’d love to win a spot in any one of your classes. They are all so awesome. I’ve been wanting to make one of these journals. Your girls are so amazing. It’s very beautiful! I love it!!! When I work in my art journal, I forget everything !!! Would luv to win a spot in this class! I luv all your work because you use all my fav things. Girls, color, and vintage! Thanks for the opportunity to win! This class looks incredible! I love old vintage books (that aren’t too smelly😁). What a perfect blend of amazing things. Thank you for the opportunity to win. What I especially appreciate about your classes are that they I can go at my own pace and it’s not a huge time commitment. I love your loose style and I find I can relax and make art without undue pressure on myself and I always learn something new. Thanks for sharing your gift! I would love to participate in this journal making course! Thanks for the opportunity! Very generous and wonderful giveawzy. I would love to try this…. Whar an amazing opportunity to win one of your fabulous classes. Wahoo would love to take this! Thanks for the opportunity to win a spot. Toni I would love to be the lucky winner of this amazing course. Loving your latest style of ladies Toni! This class looks awesome! Just love your work! And the idea with the oldbooks are super fun! Class looks like is going to be awesome. I am having so much fun with your other classes esp the journal class!! It’s becommng an obsession!! I just started Petit Fluer and I am loving it also!! I truly love your technique and teaching style!! Thank you for sharing your passion!! This will be such a wonderful class!! Looks like another winner, Toni!!!! One day you’ll learn how to do something I don’t like!!!! Till then….. I am new to your art, but just love it! I would love to win a chance to learn more of your techniques. I’m looking forward to a hands on workshop! I love the colours you use. This looks gorgeous. I’m so very addicted to your style of art – I now have almost a dozen half finished ladies because I keep allowing myself to be distracted ny each new class you release! This class looks fantastic. Love your style and old journals. I love doing your classes and especially the face to face one. So much fun.